Please fill in the application form below, or alternatively download the paper version available on the right hand side. 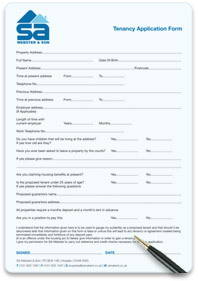 I understand that the information given here is to be used to gauage my suitability as a proposed tenant and that should it be discovered later that information given on this form is false or untrue, this will lead to any tenant or agreement created being terminated immediately and forfeiture of any deposit paid. (It is an offence under the housing act to falsely give information in order to gain a tenancy) I give my permission for SA Webster to Carry Out Reference and Credit checks necessary for tenancy application. If you do not wish to fill in the online form you can download a copy to print off. Please click the form below to download the paper version.